Mechanics go through loads of rags a day, which can be frustrating due to their inconsistent size, quality and absorbency capability. They are also bulky and not entirely hygienic. In this day and age thick, highly absorbent replacement wipers exist, available in convenient portable dispenser boxes - introducing TIDDOX's AUTOMOTIVE RHINO WIPES, which are great absorbers of oils, solvents and fluids found in garages. These heavy duty mechanics wipers are also low linting, unlike recycled T-Shirt rags. They are super absorbent wipers designed for use as automotive towels. That antifreeze leak won’t spread when you drop one of these cotton rag replacements on it, because the absorbent fibers will soak up and hold the oily fluid. Use them for grease, oil, brake fluid, and more, because solvents and chemicals won’t damage these mechanic’s rags. They are in a pop-up dispenser and – are you ready? They’re DISPOSABLE! How about an affordable, disposable, and absorbent rag replacement? These strong car wipers are 41cm X 32cm and made from polypropylene reinforced wood pulp. They won’t fall apart when they get soaked, so you don’t have little bits of oily rags dripped on the floor as you head for the trash bin. Your mechanics can use these automotive wipers for maintenance and surface preparation or for clean-up once the job is done. You get 160 rhino wipes in each box, and there are 4 boxes per carton. You can keep a box in each bay for ease of access and maybe best of all, you don’t have to transport and store bulky bags of rags anymore. 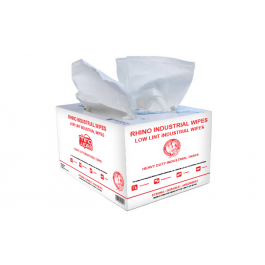 Other related products from TIDDOX's automotive range of rags, wipes and cloths are the WHITE RHINO ROLLS, the LOW LINT INDUSTRO WIPES and the JUMBO RHINO ROLL.